Read Me First FAQ – dBase, LLC. // TestEditorDrop.wfm showing how to use new feature..
text = "Drag and Drop to Editor"
//if cType = "T" or cType = "F"
New Feature - Added ability to popup list of autocomplete options when user types SET( or SET("
Fixed - Changed default for ADODatabase.SchemaName to be an empty string instead of "dbo" for a Microsoft SQL Server ADO connection. This enables displaying tables from all schemas within a database in the Navigator and in other table lists throughout the dBase user interface. Issue #1943 Fixed - Special circumstance where testing 0.00000 is less than or equal to a negative number is returning true. The zero value was actually a very small value, 3.5527136788005009e-015, which is smaller than the default precision of 10 significant digits. Added OnDisplayChange() event to class FrameWindow, Form, and SubForm. Added new property, themeBackground to PushButton class. When True (the default) pushButton's background uses the current theme's background. When themeBackground is False, the background color from the colorNormal property is used. new session property .. _app.session.isAlias(). A test to see if an alias exists. Added: .sql, .txt, ,prj, and All (.) to list for save file dialog. Fixed popping up inappropriate autocomplete options after typing a close parenthesis at end of line of code that started with a ? Fixed typo: "roperty" to "Property" in context menu for Inspector for Field within Table Designer when designing a level 7 dbf file. Fixed - Preprocessor setting in Project Explorer doesn't get compiled. Fixed - Add IDE element to Project Explorer to allow user to add preprocessor directives. Fixed - Pasting component on scrolled form no longer sets top to a negative value. Upgraded pushbutton class so the background color from the colorNormal property works to set background color of button when systemtheme is True. Fixed - listview in .exe with built in runtime (RTEXE) does not show groups as long as the app.exe.manifest file is included with the app.exe and is making sure to include version 6 common controls. the ListView object on a form will show the groups. Fixed - ADO params using the same parameter reference twice does not work. using numbered parameters causes invalid subscript reference. Fixed Save and Load of Breakpoint settings to and from plusdebug.ini to correctly handle file paths with embedded commas, conditions with embedded commas, and global breakpoints. Fixed code that updates BreakPoint Dialog's ListView control after adding, deleting or modifying breakpoints via dialog. Fixed - Runtime buffer overflow error starting in 10.0.0.0. doubled size of icode buffer used when compiling macro expression. Added code to ensure all timers are stopped and released early in dBASE shutdown sequence fixing windows error on program exit. New fix for _app.session.deleteAlias() that fixes both the lockup and prevents deletion of persistent BDE aliases. Issue #1943Fixed - Special circumstance where testing 0.00000 is less than or equal to a negative number is returning true. The zero value was actually a very small value, 3.5527136788005009e-015, which is smaller than the default precision of 10 significant digits. Applications that are signed with a standard code signing certificates need to have a positive reputation in order to pass the Smart Screen filter. Microsoft establishes the reputation of a new executable based upon the number of installations world wide of the same application. So, an initial release of the installer .exe may produce this message. If you get this message.. Click where it says ‘More Info’ … this is a link to open the option to run the installer. Click ‘Run anyway’ to continue. Is Windows XP supported in dBASE™ PLUS 11? NO, dBASE™ PLUS 11 is not designed to work on XP. Since Microsoft dropped support for the OS back in April 2016 we have followed suit. While there are still many users of XP, we are seeing a dramatic drop in the number of people using it. It is never easy to drop support for a OS, especially one as popular as XP. However the resources needed to retrofit, recompile, retrofit, etc. makes it unfeasible to continue support more so when you know that if you hit a snag with the older compiler for instance, you can't go to Microsoft for a fix. So that puts us in an untenable position for a platform that is being rapidly phased out by organizations and individuals every day. That is why we made the difficult decision to drop support for Windows XP and Windows Server 2003 (server version of XP). Are dBASE™ PLUS 10.X projects forwardly compatible with dBASE™ PLUS 11? YES, projects developed in dBASE™ PLUS FULL 10.X should compile with little to no changes. What is a User BDE Alias? Does dBASE™ PLUS 11 support Unicode? If your DBMS ADO/ODBC driver has the ability to set the cursorLocation to 'Server' you may be able to make your ADOQuery.rowset editable and not just readable. For example the following connects to SQL Server and will make the Companies table editable in an ADOQuery object. this.COMPANIES1 = new ADOQUERY(this) with (this.COMPANIES1) left = 17.1111 top = 10.56 databaseName = "SQLTEST" sql = "SELECT * FROM Test.dbo.Companies" cursorLocation = 1 // Server active = true endwith If you are unable to use cursorLocation = 1 //Server -- then you can use ADOTable objects (which connect directly to table - NOT using sql) to edit your data on a form. You will know if the cursorLocation is settable or not by simply trying it. If it does not hold after setting the object active=true, then it is not available. Language Support: Japanese Language Runtime Files are not available. Workaround: None, we will be releasing it soon. Issue #2328 renaming the databaseName after a Data Mdule is open will not update the Databases and Tables view. Workaround: You must close and restart the Data Module designer to see changes Issue #2255 inspector pops itself back up after selecting a window outside of dBASE then back. Workaround: you can edit plus.ini and remove the section labeled: [ToolBoxInspector]. Remove the 'DockSite' setting and set Float=1 Next time a designer (such as the Form Designer) is run, the Inspector will open in a floating position. When you close the Form Designer the Inspector will close, as well. Issue #2330 Select table dialog crashes if many tables exist in an external database. When connecting through the BDE (ODBC) a 'Select Table' dialog will come up. In some cases adding a table through the 'Select Table' dialog will cause dBASE to stop working. 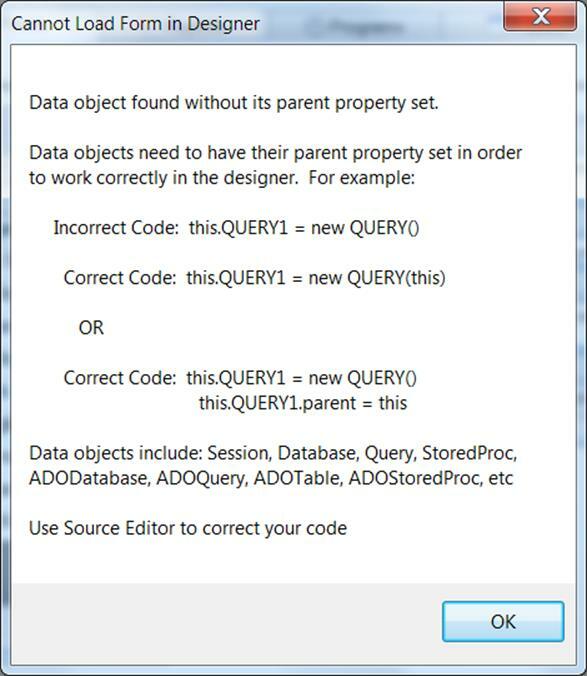 Issue #2329 After adding an ADOQuery object to the design surface, and set it so that the SQL property doesn't exist, and the active property is false, the dmDesigner object ignores it, and when saving and exiting, it removes the ADOQuery object completely Issue #2324 Get 'Rowset is Read Only' - trying to change 'View by Query' in Multi-Table View. This happens specifically when using lookupRowset on a field in a table that is used also in the 'Multi-Table' View.